You will quickly realize how fabulous sweet potatoes are when roasted with seasoning – they add a really fun new twist to the traditional taco! Preheat the oven to 200ºC (180ºC for fan assisted ovens), gas mark 6. Spread the sweet potatoes in a large roasting tray. Drizzle over 1 tablespoon of the oil and toss to coat then sprinkle over the taco seasoning mix and toss again. Roast for 35-40 minutes, turning once, until golden brown and tender. Meanwhile, bring 500ml water to the boil in a large saucepan. Add the quinoa and boil for 10 minutes. Drain well, toss in the remaining oil and spread out on a large shallow roasting tray. Roast in the oven for 10-15 minutes, stirring once, until lightly toasted. Mix together the feta cheese, parsley and lemon zest in a small bowl and set aside. Heat the tortillas as directed on the packaging. 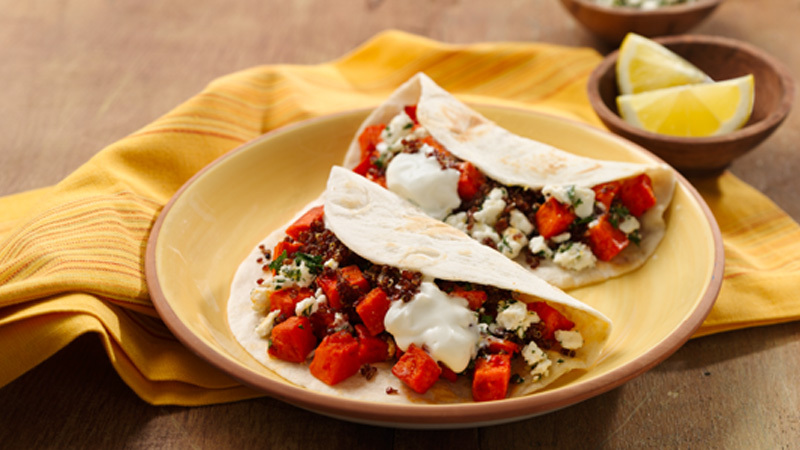 Spoon the roasted sweet potatoes onto one side of the warmed tortillas and top with the feta mixture and roasted quinoa. Top with a dollop of yogurt and fold over. Serve with lemon wedges. Replace the feta cheese with crumbled Wensleydale cheese or ready grated mozzarella. 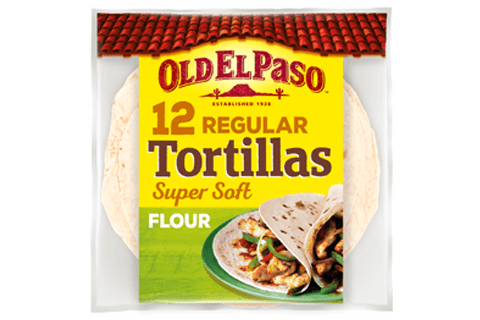 For a spicier flavour replace the taco seasoning with Old El Paso™ Seasoning Mix for Chilli and add a finely chopped red chilli to the feta mixture.